About every 1 yr. and 7 mos. Venus comes around from behind the Sun, after its superior conjunction, and moves in its orbit closer to the Earth with each month. As it does this, Venus gets bigger and brighter and the planet's illumination angle changes. During this time earthlings can witness the telescopic phases of this planet in the early evening sky. 2004 and 2012 are two years that Venus goes through the same phases at similar times and is about the same distance from the Earth at these times, so these years will be used to describe the phases of this planet. 2004 and 2012 are also the Venus transit years, when the planet can be seen crossing the Sun. Keep reading to learn more. When Venus journeys away from the far side of the Sun toward the Earth, it can be seen in the early evening sky. During this time Venus moves from a full phase toward a thin crescent phase (left side of the image). When Venus moves from a thin crescent phase toward a full phase, the planet is moving away from the earth (right side of the image) and is visible in the early morning sky. Even though less and less of Venus is illuminated as it nears Earth, the planet grows brighter and brighter. This occurs because it is moving closer to the Earth and appears bigger and bigger. As the distance between Earth and Venus shrinks the apparent diameter of Venus increases and so does the area of its illuminated surface. A thin crescent Venus closer to the Earth looks bigger and, therefore, brighter than a small full Venus farther away from Earth. Thus, Venus thins, "fattens" and brightens simultaneously! Review the above image. crescent phase looks more brilliant from Earth than its full phase. Venus is the brightest of all planets, because it is the closest planet to the Earth. In the night sky this planet is brighter than all the stars and second in brightness only to our Moon. Often it is mistaken for a UFO! Also, as discussed above, Venus appears even brighter when the planet is in its crescent phase. A third reason for its blazing brightness is that Venus is completely enshrouded in layers of bright clouds. These white sulphuric clouds around the planet act like a mirror, reflecting over 75% of the sunlight striking it. As crescent Venus approaches and passes the time it lies between the Earth and Sun (inferior conjunction), the planet appears to move in a reverse motion through the stars and constellations. This apparent "backward movement" is called a retrograde and lasts about 40 days for Venus: in 2004 May 17 - June 29 and in 2012 May 15 - June 27. Compare the retrograde motion for Venus in 2004 and 2012. When Venus is retrograde, it is in a close approach to Earth and has a strong influence on our planet. It is said that at this time humanity learns important lessons about the true value of relationships. Interactions with people and things are evaluated. During its retrograde cycle Venus moves from a waning crescent phase in the evening sky to a new phase at its inferior conjunction and finally to a waxing crescent phase in the morning sky. Evening retrograde Venus, in a waning crescent phase, is seen low on the western sunset horizon sinking into the Sun's glaring light preceding inferior conjunction. When retrograde Venus passes inferior conjunction it switches from the western sunset horizon to the eastern sunrise horizon. About 10 days after its inferior conjunction morning Venus, in a waxing crescent phase, can be seen rising out of the Sun's glaring light. The orbit of morning Venus moves it away from Earth toward the far side of the Sun. Review image above. Note: When tracked, the motion of 5 Venus retrogrades in 8 years form two striking patterns in the heavens. One, from the solar system's perspective, is a 5-pointed star . The other, from the Earth's perspective, is "the beautiful rose" with 5 inner petals. Two 8-year Patterns of Venus and a 5-pointed Star Animation Learn more about the pentagonal cylcle of Venus here. A new 5-pointed star and beautiful rose begin with the with the 2012 Venus Transit. When Venus is closest to us, it lies between the Earth and Sun at inferior conjunction with its illuminated surface facing the Sun. We can't see Venus at this time because no light is reflected toward us! This is a New Venus, similar to a New Moon. The New Venus lies hidden in the Sun's glare ready to switch from the sunset to the sunrise horizon. Note: Tuesday, June 5, 2012, 6:09:22pm PDT (June 6, 01:09:22 UT) marks the mid-point of the 2012 Venus transit. The transit starts about 3 hours before this time and continues about 3 hours after. Venus has phases like the Moon. These are seen with a telescope, although some say they can see a crescent Venus with the unaided eye. Venus moves from a full phase to a waning crescent phase in the evening sky. A New "invisible" Venus occurs at inferior conjunction when its illuminated side faces the Sun away from the Earth. At rare times a New Venus can be seen as a black dot crossing the Sun; this is called a Venus transit. After inferior conjunction the planet switches from the sunset to the sunrise horizon. Venus then moves from a waxing crescent phase back to a full phase in the morning sky. Venus reaches greatest brilliancy in both the evening and morning sky, about 36 days before and after inferior conjunction. The 2004 and 2012 transits of Venus mark the beginning of two 8-year cycles of movement for the planet. Each cycle of movement when charted forms a five-pointed star and a beautiful rose in the heavens! Five makes possible the Ascension. A new 5-pointed star and beautiful rose begin with the with the 2012 Venus Transit. See the two heavenly patterns formed by Venus in 8 years, one from the solar system's perspective, the other from the Earth's perspective. A Venus transit like an eclipse has a dark side to it. Once the shadowy nature is revealed, a healing and an evolution of consciousness can take place. Venus represents the Sacred Feminine. It is the planet of Higher Love, human unity, beauty and creativity. It is known as the Bringer of Light. When Venus is in its new phase and dances invisibly in the light of the Sun or takes center stage during a Venus transit, the rays of the Sun transmit Venusian qualities to Earth. We are truly blessed when we can receive these emanations. Ancient Mayan prophecy proclaims that the 2012 Venus transit gives birth to the new world of consciousness. Look Up! This is a marvelous and breathtaking planet. Be amazed and delighted! or the Sun and Mercury for any location, date and time. Also image the solar disk size for several solar system objects. 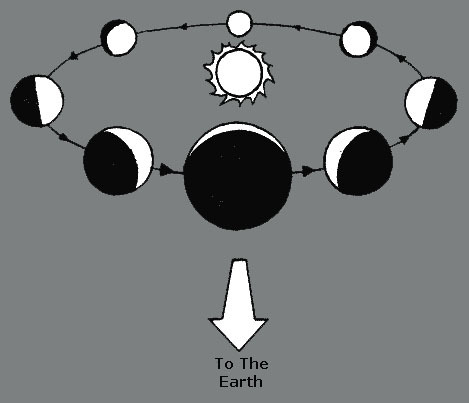 Earth, was the center of our planetary system.